baby Ridley bump. : Bath Time Routine & an IncrediBundles Giveaway! Bath Time Routine & an IncrediBundles Giveaway! 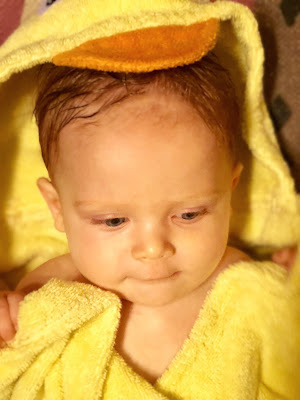 I remember giving Georgia her first bath right before we left the hospital to come home. We decided to delay bathing for 2 days which has really seemed to be the route that many parents and hospitals seem to be going these days. I remember she screamed the entire time, she absolutely hated it! This is exactly how bathing went for the first week or so when we had to give her a sponge bath util her little umbilical nub fell off, then we could put her in the tub. Once she was able to get a real bath she really enjoyed it and always has since then. Bath time for us is every other night in the early evenings after dinner. She usually has pancakes in her hair and sticky little hands so it's best for us if she gets her bath right before bedtime. This routine also usually helps settle her for bed as well. 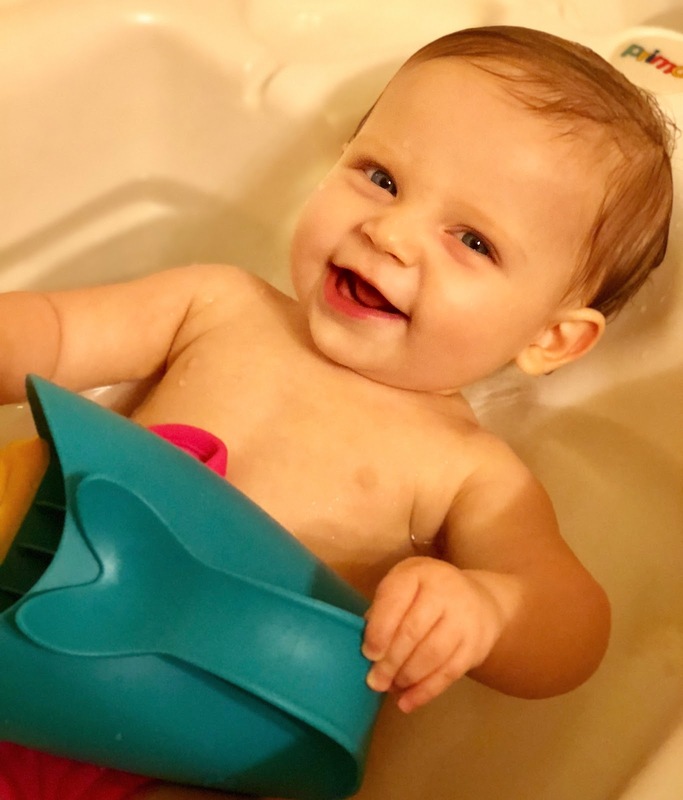 When Georgia was a newborn and infant we used the Angel Care tub which we loved! Then when she got too big for that we switched to the Primo baby tub. Both of these have been great for us & both are under $25! We still use the Primo tub now so that we don't have to waste a ton of water filling up the entire bath. Georgia loves to kick and splash in the water and mama loves it because she can either sit up in it or she can lay back in it which is best for hair washing. Undoubtedly, Georgia's favorite part about bath time is playing with her toys. She loves when water is poured over her hair, she loves to splash and kick her legs non stop. When IncrediBundles reached out to me to collaborate I was so torn on which route to go. They offer some really amazing book, toy, diapering, sleep, and bath bundles. Not only do they offer preassembled bundles, they also offer the option to create your own custom bundle as well! 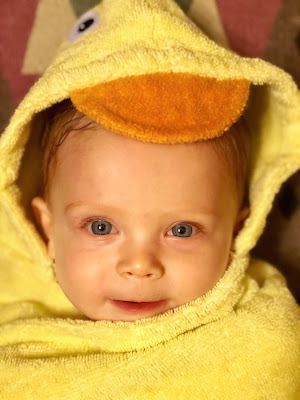 So after scouring their site for a few days trying to make my decision, I ultimately decided on the Just Ducky Bath Bundle because I had been recently searching for some new toys for Georgia specifically for the bath. Our bundle came in a day! I was floored by how quickly their shipping was. It came in an amazing reusable storage box, and the contents were all wrapped up nicely in tissue paper. This bundle came with SkipHop stacking bath toys and the SkipHop Moby Waterfall Bath Rinser along with an adorable terrycloth duck-themed hooded bath towel. 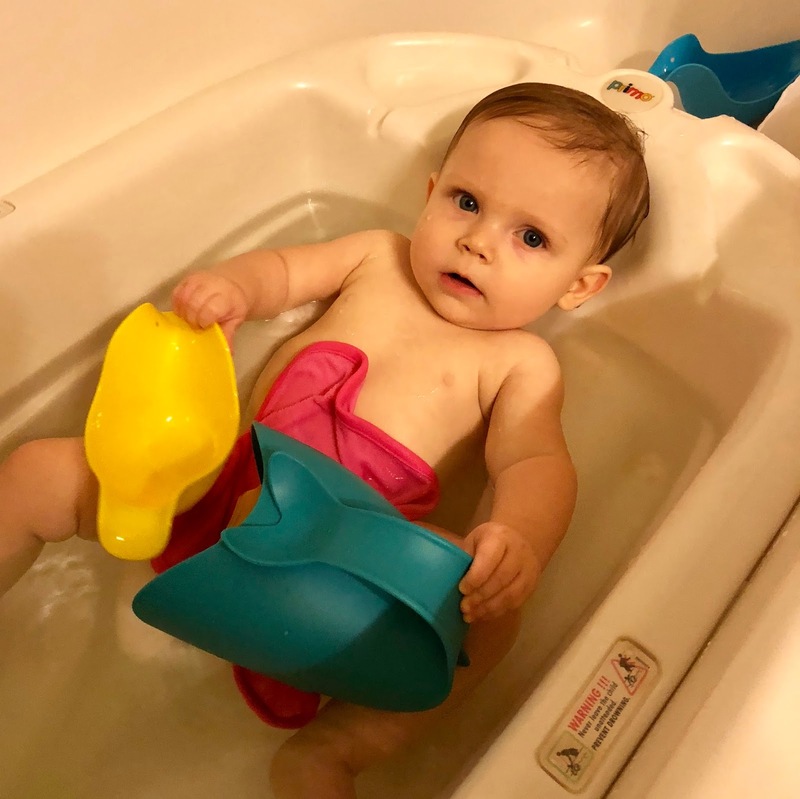 Georgia loves to have her hair rinsed and the Moby rinser is perfect for this as it has a rubber lip that fits to her forehead which prevents water from getting into her eyes, it also has a handle on it which is a huge improvement from the plastic cup I was using prior to this! The towel is big unlike some of the other hooded towels that we own that she has now outgrown, this one wraps all the way around her and is so cute! I love the idea of IncrediBundles for baby shower gifts, Christmas or birthday, or even as a gift to yourself. Something like their diaper subscription would definitely make life easier as a mother! 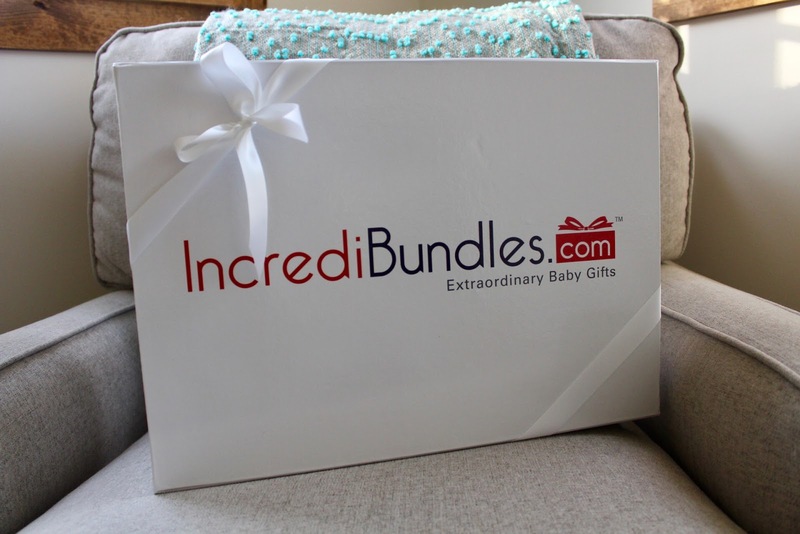 I am so excited to be giving away to one lucky winner a $50 gift card to IncrediBundles just in time for the Christmas season! You can enter via the Raffelcopter below, and find me on Instagram for even more ways to enter! What a wonderful gift for a new mother! Any bundle would be terrific. 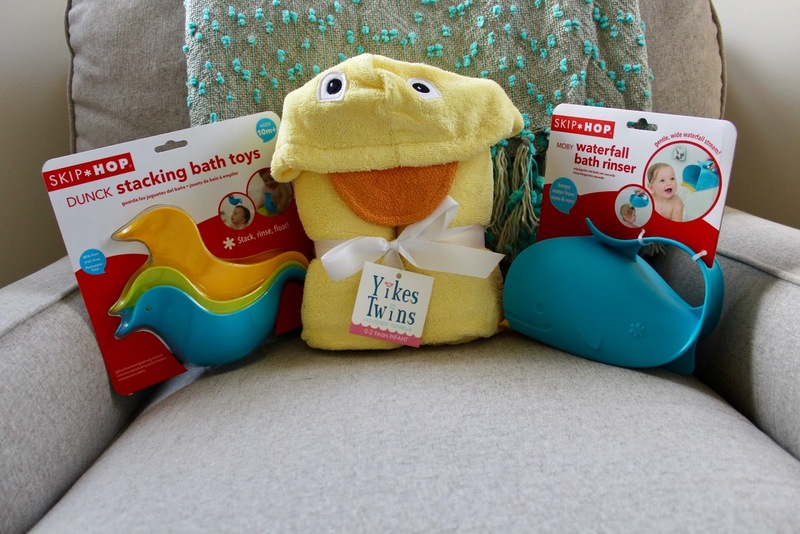 I love the Hippity Hop Into the Tub bundle! I have that rinser but Bowen wont even remotely lean back for me to use it. Instead he plays with that while I rinse his hair out with something small and with a little water at a time. Love the towel, so cute!! I love the alphabet nesting blocks! The Bedtime Book Bundle would be fun to have. The organic bundle looks nice! Georgia is just so precious and suits yellow! I love the Baby’s First Book Deluxe Bundle, would be perfect for my brand new wee miracle baby boy! I would choose the deluxe book bundle! I would select the book or bath bundle. This is fabulous. We would probably do a custom bundle but the book bundles are so great too. I love the Eric Carle bundle...but I think creating a bundle would be so much fun! I love the bath bundle! Thank you! The bath bundle is adorable! Awesome giveaway! Thank you! One of the book bundles. What a fun gift idea! Picket Fence Baby Store Giveaway!